The first word of the Song of Moses (Ex. xv. ), known as "Shirat ha-Yam" (The Song at the Sea), read in the synagogues in the lesson of the seventh day of the Passover (the anniversary of the crossing of the Red Sea), in the lesson of Sabbath "BeshallaḦ" (Ex. xiii. 17-xvii. 16) in the yearly cycle of Pentateuchal readings, and at the conclusion of the Psalms in the daily morning service. Traditionally associated with the song is a very ancient intonation, which has indeed been popularly claimed to be the actual chant sung by Miriam and her sisters, and which probably enkernels a true relic of Temple music. It would almost suggest itself to the earliest reciters of the song to chant it in an echo of the martial notes of a trumpet-call. Trumpet-calls remain the same throughout the centuries, inasmuch as such musical phrases consist only of notes dependent on certain natural properties of every column of air enclosed in a tube. Thus the ancient reciter would, on commencing the Song of Moses, have modulated his bardic speechsong into some imitation of a trumpet-note, even as is still traditionally done when from the scroll of the Law it is read out that "Pharaoh drew nigh" (Exod. xiv. 10) with "his chariots and his horsemen" (ib. 18), or that "the standard of the camp of the children of Judah set forward . . . and over his host was Nahshon" (Num. x. 14), or that "they removedfrom Elim and encamped by the Red Sea" (Num. xxxiii. 10), or similar details of a military movement. Such modulations are known as "nedarim." So, when the cantillation of the lessons from the notation of the accents (see Music, Synagogal) had become crystallized in its various forms, the trumpet was still imitated whenever the Song of Moses was read. 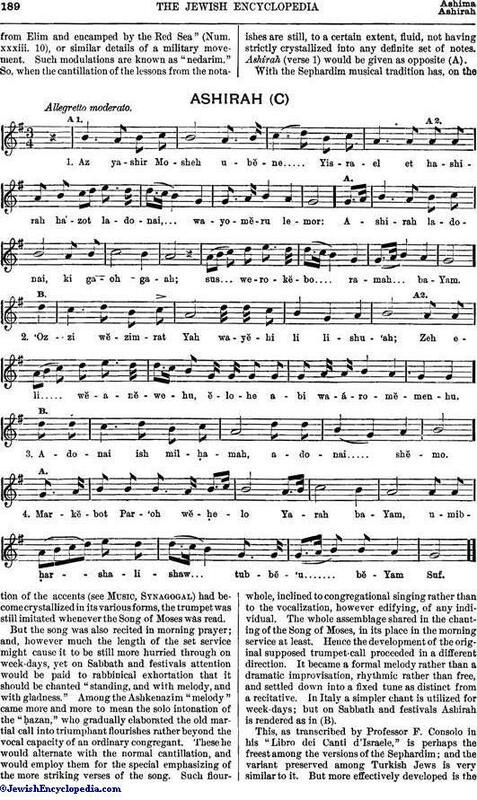 But the song was also recited in morning prayer; and, however much the length of the set service might cause it to be still more hurried through on week-days, yet on Sabbath and festivals attention would be paid to rabbinical exhortation that it should be chanted "standing, and with melody, and with gladness." Among the Ashkenazim "melody" came more and more to mean the solo intonation of the "Ḧazan," who gradually elaborated the old martial call into triumphant flourishes rather beyond the vocal capacity of an ordinary congregant. These he would alternate with the normal cantillation, and would employ them for the special emphasizing of the more striking verses of the song. Such flourishes are still, to a certain extent, fluid, not having strictly crystallized into any definite set of notes. Ashirah (verse 1) would be given as opposite (A). With the Sephardim musical tradition has, on the whole, inclined to congregational singing rather than to the vocalization, however edifying, of any individual. The whole assemblage shared in the chanting of the Song of Moses, in its place in the morning service at least. Hence the development of the original supposed trumpet-call proceeded in a different direction. It became a formal melody rather than a dramatic improvisation, rhythmic rather than free, and settled down into a fixed tune as distinct from a recitative. 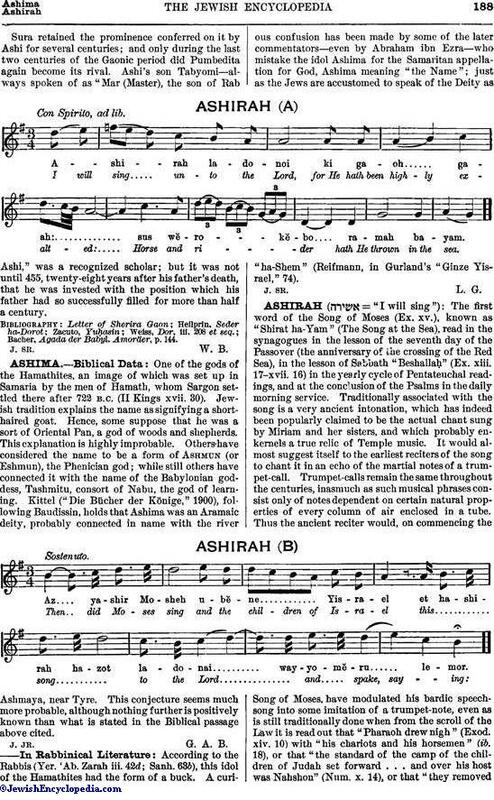 In Italy a simpler chant is utilized for week-days; but on Sabbath and festivals Ashirah is rendered as in (B). This, as transcribed by Professor F. Consolo in his "Libro dei Canti d'Israele," is perhaps the freest among the versions of the Sephardim; and the variant preserved among Turkish Jews is very similar to it. But more effectively developed is theversion marked C, handed down by the Portuguese tradition, and transmitted to the daughter congregations by Amsterdam especially. The French rendering (compare Naumbourg, "Agudat Shirim," No. 60) is a variant which establishes the original identity of the Italian and of the Dutch, the latter being the source of the English and the American forms. The essential notes of all of them, despite several characteristic phrases of the Sephardic "Ḧazanut," recall those of the trumpet-call here suggested as their original. The rhythmic clearness and tuneful definiteness of the Portuguese variant result from its developed structure (similarly to many other chants of the Sephardim, as in their versions of Ps. xix. and xcii.) in the binary or two-part form. The two symmetrical yet contrasting musical sentence, marked A and B in the preceding transcription of the first four verses, permit of the fitting of the chant to sentences of varying length and outline in the text itself. This melody was first transcribed about 1856 by Emanuel Aguilar for the Rev. D. A. De Sola's "Ancient Melodies of the Liturgy of the Spanish and Portuguese Jews." 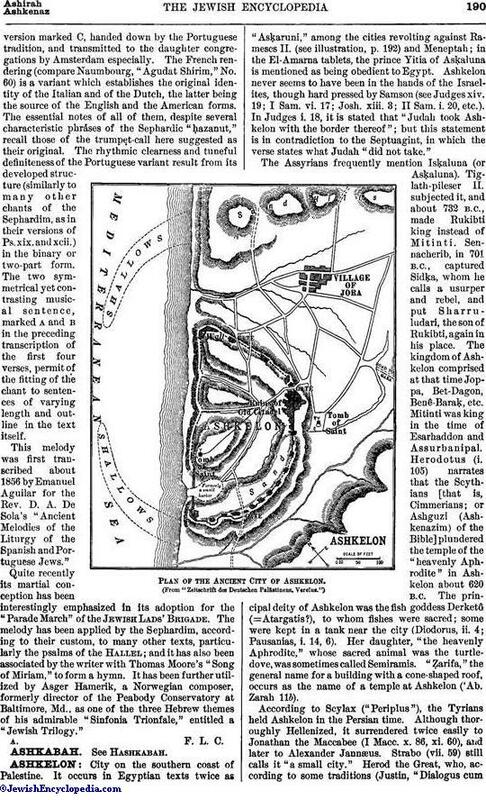 Quite recently its martial conception has been interestingly emphasized in its adoption for the "Parade March" of the Jewish Lads' Brigade. 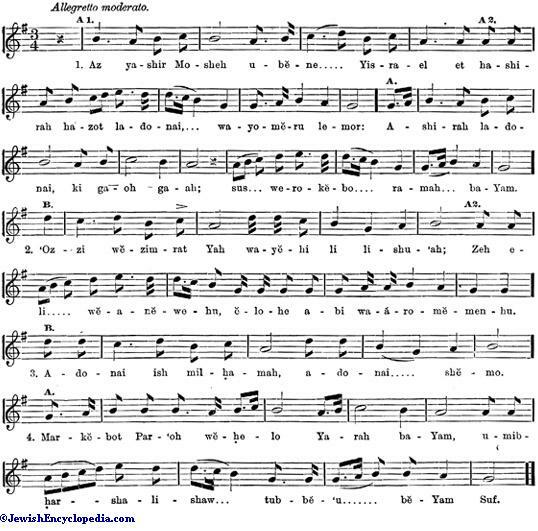 The melody has been applied by the Sephardim, according to their custom, to many other texts, particularly the psalms of the Hallel; and it has also been associated by the writer with Thomas Moore's "Song of Miriam," to form a hymn. It has been further utilized by Asger Hamerik, a Norwegian composer, formerly director of the Peabody Conservatory at Baltimore, Md., as one of the three Hebrew themes of his admirable "Sinfonia Trionfale," entitled a "Jewish Trilogy.